WAREHAM, MA – Every week in Massachusetts more than 100 people enter the hospital with diabetes-related illnesses, and dozens of people will face amputation, blindness and even death over the course of the disease. The scourge of diabetes is rapidly growing in Massachusetts, and the South Coast in particular is facing a healthcare crisis that needs to be addressed. According to state health statistics, New Bedford, Fall River and Wareham all have rates of obesity that far exceed state averages, and that means higher-than average rates of Type 2 diabetes. “Those who have family history of diabetes, are overweight, obese or eat a high-calorie diet are more at risk for developing Type 2 diabetes,” according to the Southcoast Diabetes Management Program. According to one of the most intensive studies of weight and diabetes, University of Pittsburgh medical researchers determined that the single best step patients who are significantly obese and concerned about diabetes can take is bariatric surgery. That studied determined that gastric bypass surgery recipients lost an average of 25 percent of their body weight, compared to a 5.7 percent drop for participants who changed just diet and lifestyle. And, the study showed, that 65 percent of the gastric bypass patients no longer needed blood sugar-lowering medications, and saw far more diabetes remission than patients who simply altered their lifestyle. Patients seeking help with diabetes, or with prevention, may find a combination of bariatric surgery and lifestyle changes the best path to a more healthy life. And that can help save our healthcare system precious dollars. Spending on diabetes care rose from $174 million in 2007, to $245 million in 2012, the latest figures available from the American Diabetes Association. And that’s just the monetary cost, greater still is the toll on individuals and family members. The Weight Loss Surgery Program at Southcoast Health has become one of the state’s largest and most successful, working with patients to address the primary environmental factor that causes diabetes – weight gain resulting in obesity. The largest program in New England is local, at Southcoast Health, where the surgery serves more than 700 patients a year through certified centers at Tobey Hospital in Wareham and Charlton Memorial Hospital in Fall River. For Dan O’Brien, 30, of Scituate, surgery at Tobey’s center changed his life. “I was wearing a 46 inch waist and I’m thinking, ‘now this is too tight and I have to go up to a 48’ – I just thought ‘enough is enough,’” O’Brien said. That Christmas, the scale told him he weighed 325 pounds. 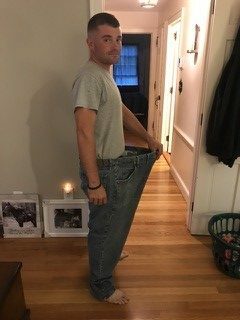 A friend of his had lost 200 pounds through the Weight Loss Surgery Program at Southcoast Health’s Tobey Hospital in Wareham. In March of 2016, after careful health screenings to be sure he was safely eligible for the surgery and a series of meetings with Dr. Rayford Kruger, the Medical Director of the Weight Loss Surgery Program, O’Brien had the gastric sleeve surgery dramatically reducing the size of his stomach that he now says has changed his life. “I am now at about 156 pounds and size 30 pants,” O’Brien said. Dr. Kruger stresses that surgery is only part of the solution for patients like O’Brien. “Bariatric surgery is a significant part of our practice, but it takes more than surgery to achieve long-term success,” said Dr. Kruger, MD, FACS. Kruger said the Southcoast Health program treats patients who are morbidly obese or significantly overweight, defined as being 100 or more pounds overweight, with surgical procedures that allow people to lose the weight safely and improve their health by resolving obesity-related health conditions. Kruger said a successful program follows up with patients after surgery to be certain vitamin levels, weight, exercise and nutrition issues are under control. O’Brien, a heavy equipment operator who lives in Scituate, said for the first time in years he has energy to spare, and years of weight-related pain – in his back, neck and legs – are over. O’Brien says success does require discipline: He worked with staff at the Weight Loss Surgery Program for months after the operation to be certain he was adhering to a healthy diet, taking vitamins and that he walks every day, usually three or four miles. “There is motivation in just watching the weight come off,” he said. The other day O’Brien dug up a pair of his old pants and realized something: “I could put those on and then put another person in there with me,” he said with a laugh.